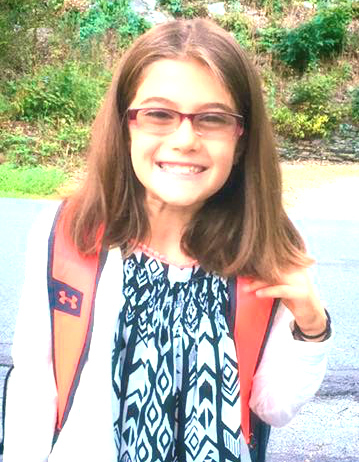 Ashley is 10 years old and was diagnosed with celiac disease at 8 years old. It all started when she was in 3rd grade, she had moved up to the next level elementary school in our school district and at the parent teacher conference the teacher kept saying that Ashley always needed to use the bathroom. Then she started having ankle and knee pain at night, sometimes it hurt so much, she would cry. the bathroom trips, the "accidents", her not gaining weight, even though she was always hungry and even the cavities, which, she never drank soda and hardly ate candy, but would still get cavities - this all had to do with celiac disease. Ashley started gaining, the joint pain eventually dissipated and the last visit to the dentist she was cavity free! Ashley is in 4H and has to do a public presentation every year, and she chose celiac disease as her topic. She won the highest award for that presentation and has gone on to present it to her class, for others to learn & raise awareness. Listen to your child. Take that extra moment and let them explain what they think they feel. My daughter tried many times to tell us in subtle ways that only young children can, and when I finally listened to her say she really needed to use the bathroom 10 times a day in school, even though the teacher was complaining about her excessive bathroom usage, I knew I had to listen to my child & not the adult. Ashley, I'm so proud of you! Teaching others about celiac disease through school projects is an AWESOME way to teach your peers, teachers and others about this autoimmune disease! Keep up the good work! And yes Mom, LISTENING is so important and at times as moms we get so hurried, at least I know that I do. So happy your sweet girl is doing so much better.